INSPIRED by the new Star Wars movie, Nick Boulos experiences the out-of-this-world landscapes of Bolivia. With not a soul to be seen all the way to the horizon and the silence almost deafening, the red picnic table was unfolded and laden with chicken, rice, vegetables, sweet oranges and three varieties of the 200 kinds of potato grown here in Bolivia. There was just one thing missing. “Could you pass the salt?” I quipped. David, my guide, squealed with laughter. There may have been a noticeable absence of a salt shaker on the table but if there was one thing we weren’t short of it was salt. Sitting on plastic stalls that scraped against the ground’s coarse surface, we were in the middle of South America’s most surreal landscape: the Salar de Uyuni salt flats. Occupying a patch of southern Bolivia half the size of Wales, they are the largest in the world, a dreamlike expanse as sheer and white as a sheet of paper and so blindingly bright that it’s impossible to be here without sunglasses. Unfolding for thousands of miles like a frozen desert, it was as though we had landed on a different planet. And, in some ways, we had. Hollywood producers were so captivated by this barren yet ethereal wonder that they used it as the backdrop for the fictional planet of Crait in the new Star Wars Episode VII: The Last Jedi movie, which came out on Friday. I took it all in – well, almost all of it – from about halfway up the slopes of the dormant Tunupa volcano. Our Jeep bounced along the unpaved road until coming to an abrupt stop beside a narrow walking trail, which we followed for several minutes. Eventually we reached the opening of a cave, its dark and eerie interior fi lled with gruesome discoveries that took me rather off-guard. Minding our heads on the low roof, we ventured deep inside towards its most darkened corners, where the mummified remains of ancient tribespeople had been laid to rest in the foetal position. “They believed they would be reborn,” explained David as the skeleton’s sunken eyes bore into mine. Outside, we made our way back to the land of the living. The community of Coquesa sat on the lower slopes of the peak: a cluster of thatched houses surrounded by arid land and stone walls that protected precious crops which produced grain-of-the-moment, quinoa – loved by the likes of Gwyneth Paltrow. Most of the 200 residents were nowhere to be seen but inside the small museum – one dusty room filled with indigenous relics and stuffed llamas – I met ticket attendant Sandy. “My family breed llamas and grow quinoa. We have no water except the rain and whatever flows down from the volcano. I pondered Sandy’s words as David pointed to a lonely spot shimmering some distance away. 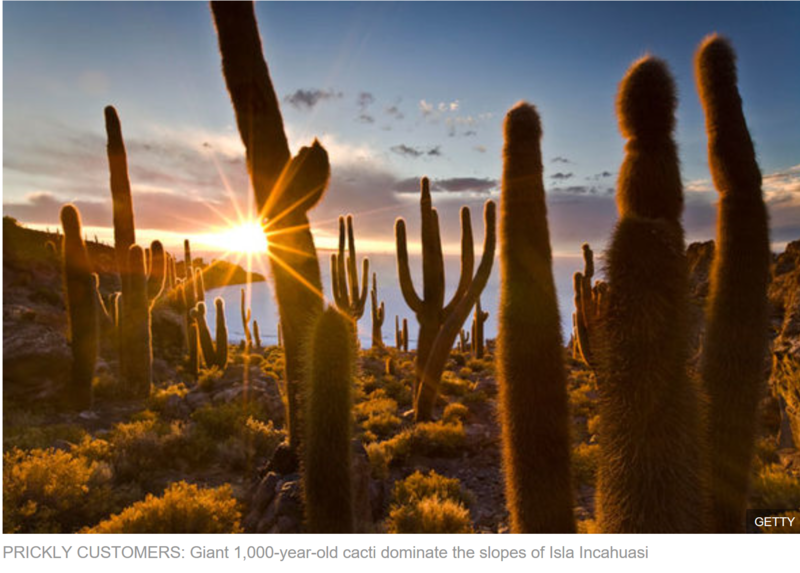 Isla Incahuasi, known as ‘Cactus Island’ rose from its surroundings 56 miles away, a rocky outcrop that was essentially an island in a sea of salt. We sped across the all-white, cloud-like terrain as though soaring through Heaven itself, pausing only to admire a lagoon dotted with flamingos. Reaching the top of Isla Incahuasi took a degree of effort. It wasn’t a particularly long or steep trail but the altitude made hard work of the 15-minute ascent. Still, it was worth every huff and puff to be dwarfed by 1,000-year-old cacti, which stood taller than double deckers and framed the infinite flats rather dramatically. It had been a long and tiring day so I was relieved to return to my hotel in time for dusk. I opted for a night to remember by staying at Luna Salada, a hotel made almost entirely from (yep, you guessed it) salt. Kitted out with traditional handwoven textiles and overlooking the flats, this novel property pays tribute to its surroundings in almost every nook and cranny, with everything from the walls to the furniture made of locally sourced blocks of salt. Even the spa offers an invigorating salt exfoliation treatment. 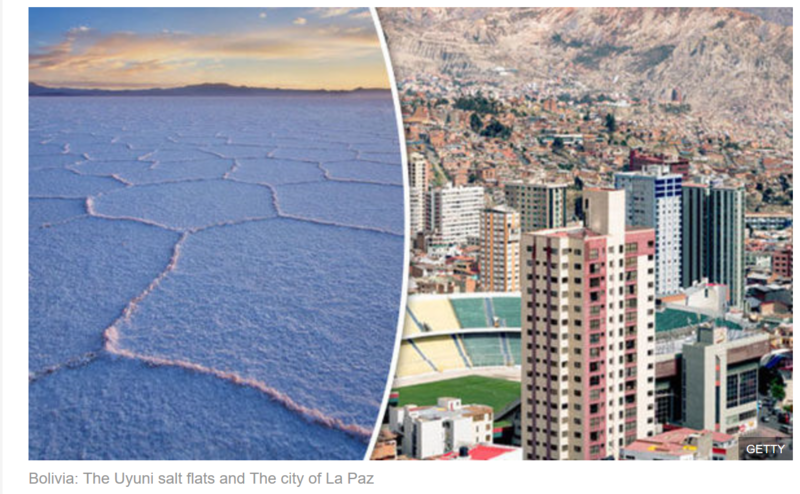 The next morning, having somewhat exceeded my recommended daily intake of salt, I left Uyuni for La Paz, (tip: grab a seat on the left hand side of the plane for aerial views of the flats). Barely an hour later, we touched down in one of the highest cities on Earth. 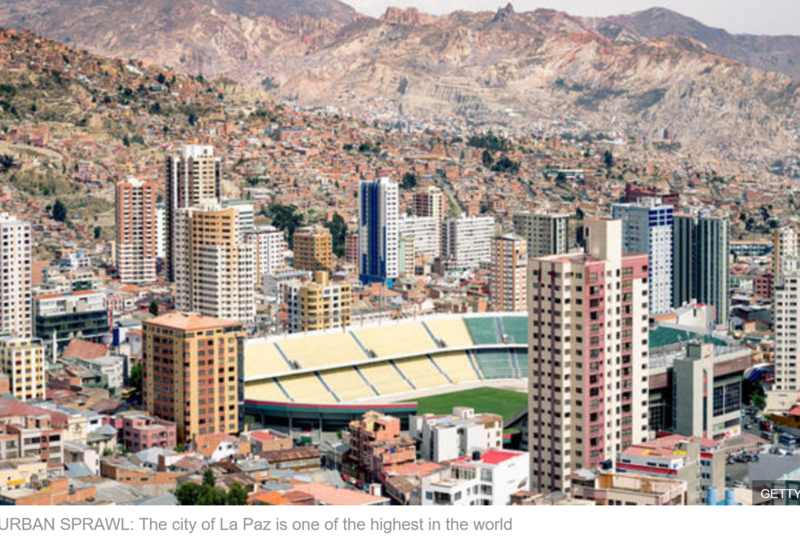 Set in a deep canyon at an altitude of 11,942ft, the first thing to strike you about La Paz is the scale of its urban sprawl. Millions upon millions of matchbox homes tumbled down the steep walls of the valley creating a chasm crisscrossed by cable cars. Dominating the scene and rising majestically in the distance is the snowcapped mountain Huayna Potosí. Several thousand feet below, in the basin of the valley, is the city’s colonial heart. I strolled along streets choked with minibuses and crowds protesting against the latest government initiative. “People in La Paz are always protesting,” joked David. We paused in Plaza Murillo, the central square with rustling eucalyptus trees, a grand cathedral and other colonial buildings that date back to the days of the Spaniards. My favourite was the large government building with a façade boasting an analogue clock that runs backwards. Later, we explored the curious Mercado de las Brujas (Witches’ Market) where all manner of potions and intriguing items were perused by women in bowler hats. Hanging from the rafters like piñatas were the aborted llama foetuses believed by ancient tribes to bring good luck. 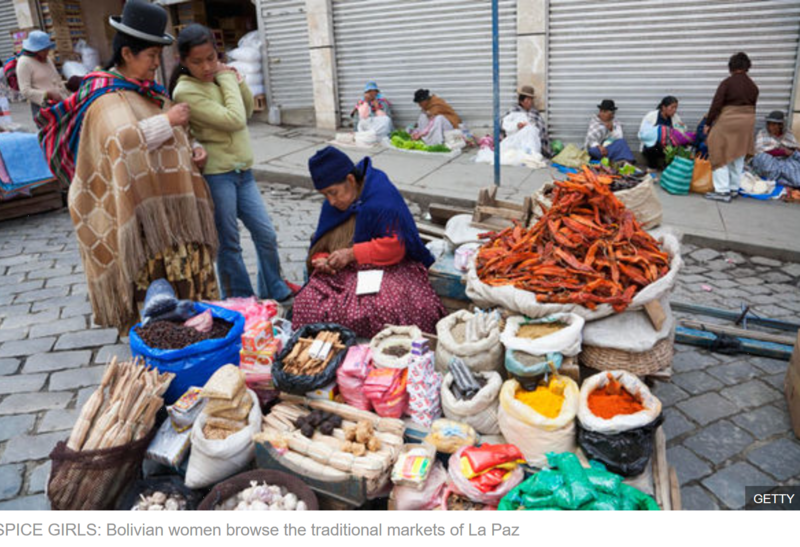 But with gleaming skyscrapers and new developments popping up, La Paz also illustrated that Bolivia is very much a forward-thinking nation. Landlocked by Peru, Brazil, Paraguay, Chile and Argentina in the very heart of South America, it’s a diverse and remarkable land that delivers highs that aren’t always down to the altitude. One of its most famous destinations is Lake Titicaca, located 42 miles to the northwest of La Paz. Stretching for 118 miles across the finest Andean scenery, it is the world’s highest navigable lake at 12,507ft above sea level and shared with Peru. Despite the division (the border runs straight through the water), it embodies a deep unity shared between the region’s indigenous Uru people who worship the mountains and believe the lake is home to mermaids. And just like their ancestors, they continue to live on floating islands made of tightly-packed totora reeds. I sailed around the lake, visiting small islands where local women in colourful skirts and long plaits that dangled towards their waists sat outside houses made from reeds. Their husbands were out fishing on boats also constructed from the durable yellowish stalks. Children gathered to drop coca leaves on the water, offerings to Ota Mama (Mother Lake) that settled on the surface like confetti. It seemed a peaceful and idyllic life but not one without its problems. Whole islands have been lost in a flash due to fires caused by lightning strikes. “All we can do is pray for mercy,” one Uru elder told me. May the force be with them. l getting there Journey Latin America (020 8600 1881/ journeylatinamerica.co.uk) offers 10 nights in Bolivia from £2,078 (two sharing), B&B. Price includes flights from Heathrow to La Paz via Madrid, accommodation and transfers. Bolivia tourism: bolivia.travel. This entry was posted in Bolivia, Environment, Holidays, La Paz, Potosi, Tourism and tagged bolivian food, Salar de Uyuni, Titicaca Lake. Bookmark the permalink.